So, I figured that after a year of selling knives through Facebook and Instagram, I'd have my web guy make a site and logo for the knife business. I own and run a personal training studio full time and he did that site and it great. Anyways. The name I've been using online is Campana Coltello. My last name is Campana, in Italian it means bell, Coltello is Italian for knife. All the feed back I've gotten so far from customers, people that have mailed me about knives, friends, business clients, acquaintances, like the name, they think it sounds "high end." 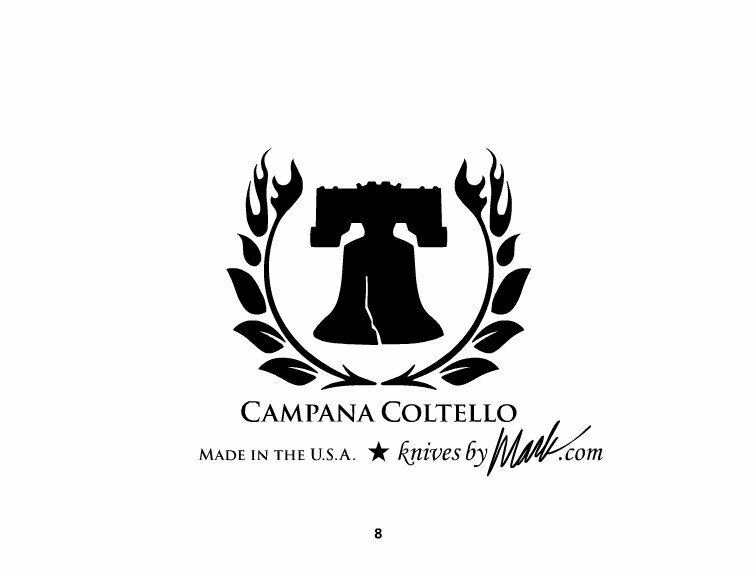 Now, I feel like the name Campana coltello is a mouthful for a web address and was going to just go with "knivesbymark.com." Easy to remember, spell and say. Somehow a seed has been planted in my head that has me second guessing my plan. Like, the web address should be the company name, should be the email, so on and so fourth. What do you guys think? I've also attached a working progress of the logo. It won't be so busy, but it gives you an idea. I'm leaving myself open for honest opinions here. If you think something blows donkey, just say so. Im not used to selling a product. In my full time job,I'm the product, my knowledge is the product. M Campana Fitness. I do see that it does say "knives by Mark" under the logo. But when I first scrolled down I wasn't sure what coltello was, your last name I first thought until you explained your whole theory. I think if your selling most of your knives in good ole U.S.A., it may confuse most of us who don't speak Italian. But it's a real nice looking logo, maybe just change coltello to cutlery or knives. Just one opinion though. That's what I thought Wayne. Thanks for the input. I really am thinking I need to look into another name for the business that can also be my.com. I think its a bit confusing if you use the web address..knives by mark. It should be the same as the company name in my opinion. Or it should be knives by Mark Campana, but then again that's a long website to, since non of us know Italian even though my grandma is a full blooded Italian and I have heard a lot growing up the Coltello gets lost a little with out the back story. I agree it does sound high end, even if you changed the Coltello to Cutlery and just did CampanaCutlery.com would sound good. How about Campanacotelloknives.com? It might be a little long, but I don't really think so. It's the name of your company and you maintain the name recognition you earned on Facebook and Instagram. No use throwing all of that good exposure out the window with a name change. The Cotello and Knives might be redundant to the few who may speak Italian, but to the rest of us, it sounds kind of cool. I think I agree with you guys about the name, shorter and simpler is better. Are you thinking about using the logo as your makers mark on blades? I'd be a little worried that the bell image in relation to your name would be out of proportion for a mark. Maybe not, just a thought, but I think having the makers name a little more prominent is nice. Maybe use the Coltello as a model name for one of your designs. Thanks everyone. I took all the feed back and really simplified everything. After all, no one really cares a ton about the name, it's the product. So, keep I'm keeping it simple.